Sitting high in the steeple of our church Meeting House, the Austin Cornelius Dunham Carillon was commissioned by the Board of Trustees of Connecticut Agricultural College (now known as the University of Connecticut) in 1930. The instrument was originally conceived in the 1920s as a set of chimes for the College. It was built by the Meneely Bell Foundry of Watervliet, NY, and installed in 1931 in the tower of Storrs Congregational Church–there being at the time no other structure in the campus area appropriate for housing such an instrument. The instrument is named after the Willimantic industrialist whose gift of farmland led to funding for its construction. The Dunham Carillon is a historic carillon, one of very few carillons anywhere that are completely American made. The instrument was renovated and refurbished in 2011 by the firm of Meeks and Watson and Company of Georgetown, Ohio. The project included the casting of five new bells to extend the range of instrument to a full three octaves and replacement of the action. The carillon was rededicated on April 30th, 2011 as part of the 50th Anniversary celebrations of the School of Fine Arts at the University of Connecticut. 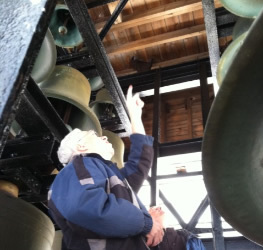 The Dunham Carillon now has 36 bells. The largest bell, or “Bourdon,” weighs 2,800 pounds, while the entire instrument weighs about 16,500 pounds.